KANSAS CITY, KAN. ----- It is a family not quite like any other – a family assembled from Alaska on the West, Puerto Rico on East, Michigan to the North and Texas to the South and several Kansas communities in between. 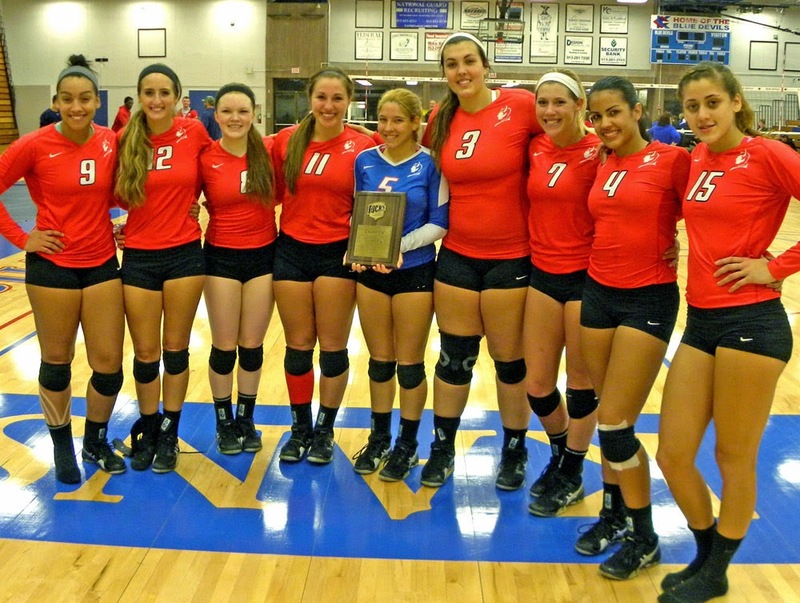 Officially, it’s the national tournament-bound Kansas City Kansas Community College volleyball team but to head coach Mary Bruno, her staff and the 14-member Blue Devil squad its far more than just a team. The Blue Devils will open tournament play Thursday at 11 a.m. against Glendale, Ariz., at Phoenix College in Phoenix. All games will be streamed in the NJCAA website by clicking on national tournaments. It’s a family put together from far distance places. Sophomore defensive specialist Lily Cullers came to KCKCC from Palmer, Alaska, after being discovered on a recruiting website. The same for 6-2 freshman outside hitter Cecelia Augustine of Ypsilanti, Mich. Both came to the KCKCC campus for a visit, liked what they saw and signed. Four Blue Devils are from Puerto Rico. Libero of the Year Andrea Aparicio and Jayhawk second team selection Jasdel Gonzalez were discovered on a recruiting trip taken by Bruno (Dee Bruno) and her mother in December of 2012. Freshman Kimberly Martinez was discovered by manager Franchelle Gonzalez (sister of Jasdel) while living in Puerto Rico. The fourth, Junelie Irizarry, had moved to Papillion, Neb., when discovered by the KCKCC staff. “Coach Mary and Coach Dee came to Puerto Rico for a recruiting tournament for American coaches and we kept talking by e-mail and phone and they offered the best,” says Aparicio, who arrived in the U.S. for the first time in July of 2013. “First it was hard but then I started adapting.” Fluent in English, Aparicio hopes to earn an AA next spring and play two more years in the U.S. before returning home. The remainder of the squad is all from Kansas. Sophomores Lily Thornberg and Peyton Pender, a transfer from Saint Mary, are both from Junction City. Kailee Dudley, a summer transfer from Butler County, went to high school at Lawrence Free State, while soph Carlyn Walsh attended Wichita Northwest. The three other freshmen are from Leavenworth (Allyssa Lutgen), Douglas (Janelle Fowler) and KCK’s Bishop Ward (Lexi Nick). Four Blue Devils – all sophomores – finished among the national leaders in statistics. Thornberg, who was named Co-Setter of the Year, and No. 5 in assists with 10.74 per set, was on Bruno’s wish list early. Dudley, who was the Jayhawk Freshman of the Year in 2013, contacted Bruno about transferring when she decided not to return to Butler. “She was kind of a last minute addition,” says Bruno. And a good one, earning All-Jayhawk first team honors and finishing 21st nationally in blocks (1.24) and 30th in hitting percentage (.317). “A great decision,” said Dudley. Russell, who was all-state in volleyball, honorable mention all-state in basketball and a four-year qualifier in the state track meet at Marysville, finished fifth in the nation in kills (516) and eighth in average (3.94). Aparicio was something of a human dynamo diving on the floor countless times to return shots as she took advantage of her 5-4 size to make numerous saves. “I think being small helps. I’m a little faster and react better,” said Aparicio, who finished 21st in the nation in digs per set (5.54) and 22nd in total digs (693).